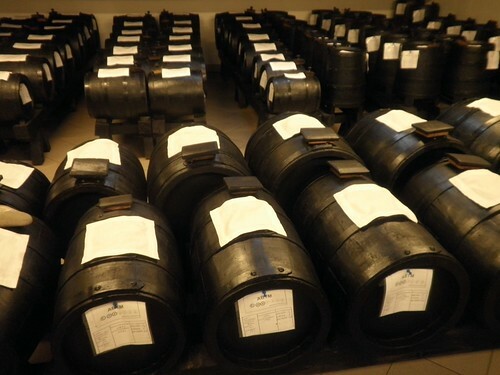 On Friday, I went on a field trip to an acetaia (balsamic vinegar factory)–something I’ve wanted to do for months! The region I live in, Emilia Romagna, is famous for many typical Italian products, including parmigiano, prosciutto* and balsamic vinegar. My classmates and I tasted a variety of vinegars aged from 5 years to 20, though this acetaia, which has been in the Malpighi family for five generations, has balsamic vinegar that’s aged 100 years. As it gets older, it gets both thicker and more expensive. You can buy cheap brands in the grocery store, but all the the brands stamped D.O.P. (Denominazione di Origine Protetta) are strictly regulated. All the grapes must be grown in Modena, aged in specific wood barrels and bottled in specific glass bottles, among other rules, to ensure the integrity of the product. Everything about it is natural. The grapes used to make the vinegar are only blended with other fruits or wine, if anything at all. Before a new batch of vinegar can be sold, it first goes to a taste tester. If he or she says that this vinegar (or other D.O.P. products such as cheese) isn’t good enough, it goes back to the factory to be aged until it meets approval. Thankfully, they don’t have to throw it out, as it takes decades to produce some of this stuff. In fact, If you wanted to open your own acetaia, it would take you a minimum of 10 years before you could sell anything, so you must be quite serious if this is your dream (I suppose you could have a shop that sold only 5-year-old vinegar if you wanted to get a jump on things, but you wouldn’t be very competitive). (*side note on prosciutto: Italians always say prosciutto; they never cut off the ‘o’ and say 'prosciutt.’ The same goes for mozzarella–it’s not mozzarell! I’m not sure why people say this in America).